New Lionfish Hunting Permit T-Shirt now available at our Christiansted Store. Lionfish — if you can’t beat ’em – eat em! I need a Skeeter T shirt in XXL and a Lionfish Tee in XXL. Call the shop and we can mail you a T-Shirt! Do you still have shirts like this? 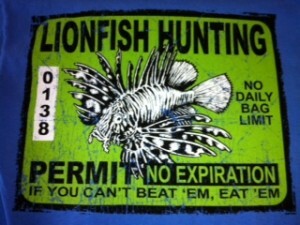 I’m interested in a few Lion fish tshirts, what colors and sizes do u offer. I’m a big guy, 2X to possibly 3X would be great! Also are they 100% cotton and do they come in long sleeve? If there is a site I can go to to check them all out, please let me know! Thanks for your time.